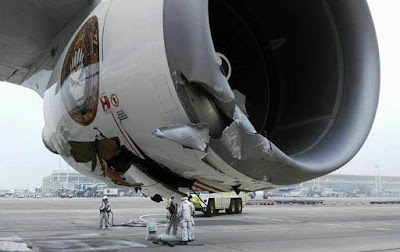 Iron Maiden’s plane, Ed Force One, has been damaged in an early Saturday morning incident at a Santiago, Chile airport. The plane was tethered to a tow truck to be taken for refuelling prior to flying over the Andes to Cordoba Cordoba, Argentina for their March 13 concert at Estadio Mario Kempes. On moving, the steering pin that is part of the mechanism that connects the ground tug to the aircraft seemingly fell out. On making a turn, the aircraft had no steering and collided with the ground tug, badly damaging the undercarriage, two of the aircrafts engines and injuring two ground tug operators, both of whom have been taken to hospital. “The flight engineers are on site and evaluating the damage, but their initial report is that the engines have suffered large damage and will require an extended period of maintenance and possibly two new engines,” reports the band. “Fortunately the 20 tons of equipment had not been loaded onto EF1 at the time of the accident. “We are happy to tell our fans in Cordoba that our Killer Krew has sorted out all logistics for us to be there with our full show for you all tomorrow,” says band manager Rod Smallwood. “We expect no disruption to the tour in any way and are looking for a replacement 747 Ed Force One while our current beauty is healed. More news on that later. Until then, believe me, we will get to you all on this tour one way or another wherever you are. Piloted by singer Bruce Dickinson, Ed Force One carries the band, crew and gear around the world on their global tour – check out a video of the plane here. Iron Maiden’s South American dates continue this week with shows in Cordoba (March 13) and Beunos Aires, Argentina (March 15), and Rio de Janeiro (March 17) and Belo Horizonte, Brazil (March 19).